Sumatra Adventure Holidays is honored to be the first company in Sumatra to participate in the Pack for a Purpose Program. 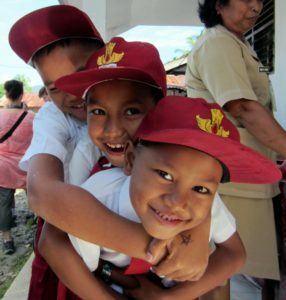 We are working with a number of local schools to secure the long term future of the people in North Sumatra through the education of our children, as we believe that our future lies in their hands. Our Pack for a Purpose Project focuses on the provision of educational supplies to assist with our children’s learning at the primary schools in the local communities. This includes the Tualang Gepang Primary School (serving 170 children from ages 7 through 12 years old), the Gotong Royong Primary School (serving 230 children from ages 7 through 12 years old), and the Batu Katak Primary School (serving 120 children from ages 7 to 12 years old). Most of the children’s parents are small farmers who cannot afford good education for their children. 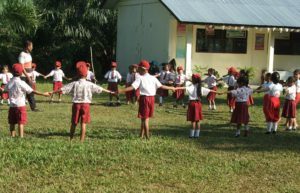 The Nature School at Selang Pangeran, Green School at Gotong Royong and the Batu Katak English School run a free English lessons in the Bukit Lawang area of North Sumatra, Indonesia. The schools support 40, 60 and 30 children, respectively, from the ages of 7 through 14 years old. If you like the idea of sustainable responsible tourism and giving back to the local communities that you visit, please contact us at enquiries@sumatraadventureholidays.com to participate in the pack for a purpose program and plan your adventure of a life time! We are proud members of Pack for a Purpose, an initiative that allows travelers like you to make a lasting impact in the community at your travel destination. If you save just a few kilos of space in your suitcase and bring supplies for area schools or medical clinics in need, you'll make a priceless impact in the lives of our local children and families. Please click here to see what supplies are needed for our project/projects.